Wapakoneta’s Tristan Gesler (1) chases Shawnee’s Jacob Miller during Thursday night’s match at Ryan Field in Wapakoneta. See more match photos at LimaScores.com. Wapakoneta’s Juan Fernandez pursues Shawnee’s Cameron Tenwalde (20) during Thursday night’s match at Ryan Field in Wapakoneta. 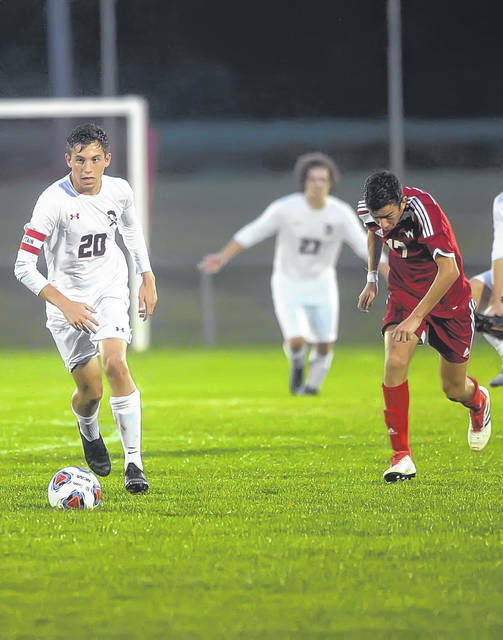 WAPAKONETA — Every time you looked up, there was a Shawnee midfielder. In all, five Shawnee midfielders controlled play, gobbled up turnovers and headed the other way. Shawnee dominated the first half and went on to post a 4-0 boys soccer victory over Wapakoneta Thursday at Ryan Field. It marked the first time in six years that the Shawnee boys soccer team knocked off Wapak in Western Buckeye League play. Shawnee is 4-1-1 (2-0 in the WBL). Wapak is 3-3, 1-1 in the WBL. “Of the six games we’ve played, we’ve only managed to put together an entire game once,” Wapak coach Keith Rambin said. Shawnee led 3-0 at the half cruised home from there. Shawnee midfielder Ryan McGuire had two goals for Shawnee, both in the first half. “It all started in the midfield,” McGuire said. Cameron Tenwalde and freshman Jacob Miller both had one goal for the Indians. Miller also had an assist. Indians sophomore goalkeeper Landon Hoehn had eight saves, seven coming in the second half. Shawnee coach Ryan Quatman has changed his formation from four defenders to three and is now playing with five midfielders, McGuire, Tenwalde, Carter Jensen, Damien Ziegler and Brayden Ward. That gives Shawnee a 3-5-2 look, with three defenders, five midfielders and two forwards. Quatman thought that was a key reason his team controlled the ball about 85 percent of the first half. “We have five in the midfield, so we outnumber most teams,” Shawnee coach Ryan Quatman said. “They have to make adjustments to us. We have five really good midfielders, who keep the ball in front of us. Shawnee outshot Wapak 18-11 for the match and 13-2 in the crucial first half. Once the Indians took possession in the midfield, they began firing shots outside the 18-yard box. “We wanted to get shots on target,” McGuire said. Then, with 35:17 left in the first half, Tenwalde ripped a shot from 20-yards out and it found the left corner of the net. That gave Shawnee a 1-0 lead. McGuire made it 2-0 with 18:14 left in the half. Miller was in the box and fed the ball back to McGuire, who fired it from 25-yards out into the lower-left corner of the net. “He put a good ball back to me and I let it loose,” McGuire said. It appeared Shawnee would jog off the field with a 2-0 lead at the half. But with less than a minute left in the half, McGuire stole the ball from the defender 15-yards out in front of the goal. McGuire drilled it from 12-yards out into the net and it was 3-0 Shawnee with 43 seconds left in the half. Miller closed out the scoring with a shot from the deep right corner to make it 4-0 with 14:13 to go. 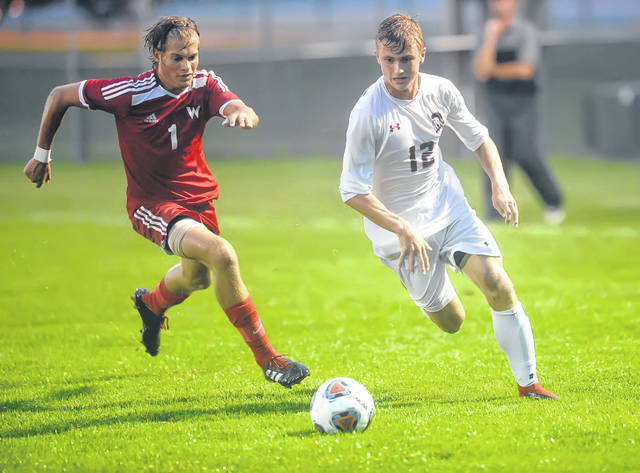 Wapak played without its center midfielder Tyler Amstutz (back). Luke Beach and Hunter Coffey helped the Wapak offense deliver a few quality shots in the second half. Reach The Lima News sports department at 567-242-0451. This entry was tagged shawnee, Wapakoneta. Bookmark the permalink.